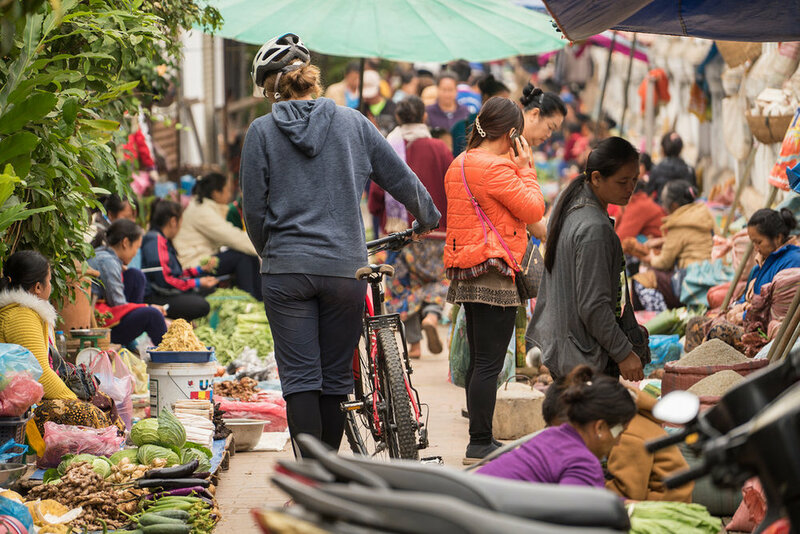 Starting in the World Heritage town of Luang Prabang and ending in the vibrant city Hanoi, this amazing cross-border excursion was designed for cyclists who enjoy riding through the mountains. The ever-changing and often spectacular landscape, along with the and diversity of ethnic groups along the way, makes every day different and memorable. Luang Prabang, Dien Bien Phu and Hanoi are the cultural and historical highlights of this tour. Other highlights include a boat ride on the Nam Ou river in Laos and a visit to Cuc Phuong National Park in Vietnam. After a one hour transfer, you'll start cycling along the Nam Ou River to Pak Mong village, where we'll stop for lunch. In the afternoon, the landscape around you will become more and more spectacular as you make your way into an area with huge limestone mountains. Overnight in a resort. Today, you'll enjoy a spectacular boat ride (4 to 5 hours) through a remote stretch of the Nam Ou River. Along the way, we will stop to visit some remote villages. Overnight in guesthouse. Today, a challenging day of cycling will bring us to Vietnam. Most of the journey will be through primary forest, in which we will encounter hill tribe villages. After the border crossing, the Vietnamese agent will pick you up for transfer to Dien Bien Phu. The city is known throughout the world as a battlefield in the first Indochina War, an Asian version of Waterloo. The city is located in Muong Thanh Valley, an area famous for its tasty rice and Tai ethnic minority traditional dance. Overnight in hotel. After a short transfer, our day will be less hilly but no less spectacular, as we head off gradually downhill, our passage overshadowed by looming karst cliffs. After lunch, we'll continue through lush, terraced rice paddies against the jagged cliff backdrop. Overnight in Hotel. We'll make a morning visit the Primate Rescue center, where you can enjoy the amusing languor species and admire the deeply dedicated ecologists working here. We'll then ride 40 km through Cuc Phuong forest to the park center and break for tea before taking a transfer to Hanoi. Overnight in Hotel.